In 1976 I went to live in El Salvador, where I was principal bassist with the National Symphony, and taught music at the National Conservatory. I was just out of college, fairly apolitical, and certainly unready for what I saw in that country. Nothing in my background prepared me for the poverty or the political turmoil that I witnessed daily. I learned Spanish and set out to discover what I could about El Salvador in particular and Latin America in general. The experience made me a much more political person, affected my outlook on practically everything, and certainly changed my music forever. Many of my compositions reflect the two years I spent in El Salvador, and the four years I subsequently spent in Mexico. Cristina Gómez is but one of many victims of violence in El Salvador in the 1970s and 1980s. She was a young school teacher, and an activist in union and feminist causes. She was abducted from her school – in front of her students – by the Salvadoran military. Her body was found later, thrown out on the street, bearing the signs of brutal torture, including acid burns. Cristina Gómez would have been just a child when I left El Salvador, and I did not know her. Although I find her death particularly moving because of her youth and profession, this piece could easily have been named after any one of at least 80,000 other civilians in El Salvador murdered by their own government since the mid-1970s. The title is a paraphrase of the title of a famous work by the great Spanish poet, Federico García Lorca, Llanto por Ignacio Sánchez Mejías. (It is perhaps worth mentioning that García Lorca was himself murdered by Fascist troops during the Spanish Civil War.) “Llanto” is one of those maddening words for which there is no single English equivalent. My Diccionario Pequeño Larousse defines “llanto” as an “efusión de lágrimas con lamentos” – “flood of tears with laments.” By extension, the word is used literarily to mean “lament” or “elegy,” although these seem inadequate renderings of the original. 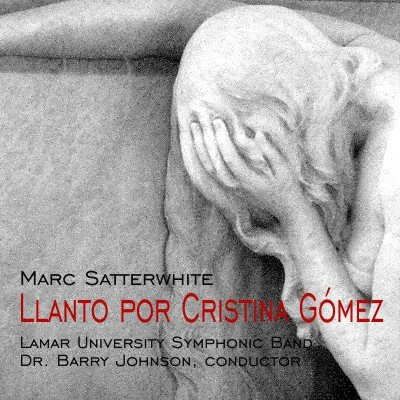 Lament for Cristina Gómez is probably the closest English equivalent. García Lorca’s poem is in four sections, and I use the titles of these sections for the four movements of this composition. There is no other direct connection with the poem. The second movement contains fragments of a Bach chorale harmonization, “Ach Gott, vom Himmel sieh’ darein” (“Oh God, from Heaven look therein and be merciful”), and the chorale is stated in its entirety in the last movement, along with fragments of ideas from the first three movements. It might be accurate to describe the four movements as three long screams followed by a prayer, a prayer that Cristina Gómez, and all others whose lives are brutally cut short by forces beyond their power, has found the peace denied her in her short life. This work was written in 1991 for the Lamar University Symphonic Band, Dr. Barry Johnson, conductor, who gave its first performance on October 5, 1992. The composition was supported by a Lamar University Research Enhancement Grant. No te conece nadie. No. Pero yo te canto.